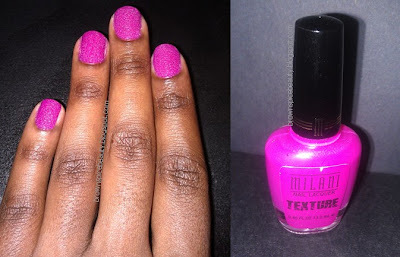 BrownSpiceBeauty: Milani Limited Edition Texture Creams Nail Lacquers Review! Milani Limited Edition Texture Creams Nail Lacquers Review! Hey BSBs! I am so excited that this is our very first nail color review. YAY!!! There are a lot of brands coming out with new textured polishes this season. 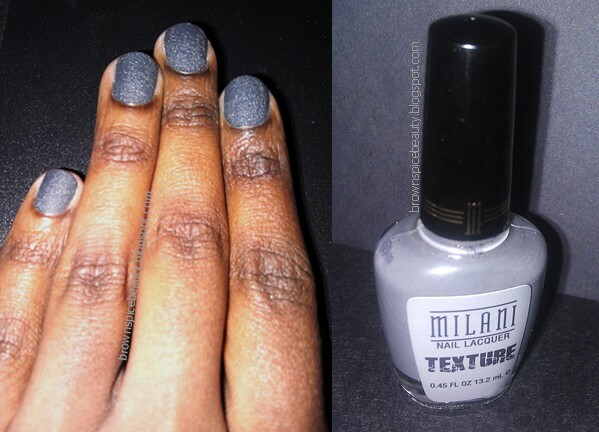 I have been road testing the Milani Limited Edition Texture Creams Nail Lacquers and I am ready to give you the scoop. These have been out for a little bit, but I wanted to give them a true test before I reviewed them. The first thing that caught my eye on these were the great color choices. They are offered in 5 vibrant jewel tones (901-Tainted In Red, 902-Spoiled In Fuchsia, 903-Aqua Splash, 904-Yellow Mark, 905-Purple Streak) and a slate gray (906-Shady Gray) and they are super affordable at only $4.99 each. I have only been able to find 2 colors (902-Spoiled In Fuchsia & 906-Shady Gray) in my local drugstore and I love them both. Both colors look great against my richer skin tone, but there is something about the look of the Shady Gray that I am addicted to. It will definitely be a go to for me. Application is simple. There is no special process. You just apply it like a regular polish. Two good coats is all you need. Any more and it starts to smooth out a bit and you lose the nice texture. I chose not to use a top coat because I liked the finish as it is. The texture and matte finish really makes the colors look velvety. It almost has the look of Stucco with the same kind of rough texture. I think you will either love of hate the feeling. It is not a sandy texture so, it does not flake off. It does not really snag on clothing or in your hair at all, but it may scrape more delicate fabrics like satin or silk if rubbed too hard. I find it to be very rugged and can take a lot more abuse than a regular nail polish. It took me doing some serious pot and pan scrubbing before I had any signs of chipping. This lacquer takes a good beating. Removal of the lacquer was fairly easy in comparison to other textured nail techniques I have tried. Just hold polish remover soaked cotton on your nail for 15-20 seconds and it comes right off. This is a big plus! Consistency: Stucco like texture creates a velvety look. May scrape more delicate fabrics. Durability: Very rugged and can withstand much more than regular polish. Removal: Removal was fairly easy with the right technique. Colors: Great limited edition colors that will work very well on richer skin tones. Value: They are only $4.99 each. Enough Said!